We have just finished the new MyInfo indexing feature. MyInfo 4 will feature much faster indexing (indexing allows you to get almost instant search results, when searching for text in your MyInfo files). The tests show 500% to 2500% improvement and even more for larger files! Auto Paste is a handy little feature, which allows you to collect information from other applications, even when MyInfo is minimized. In MyInfo 3 each time you copy information in an outside application, while Auto Paste is turned on, it was pasted in MyInfo as a new document in the tree. This is useful, but sometimes, you have very short snippets of text that you want to paste in a single document and in this case, Auto Paste does not work as it should, because it pastes only as new document. 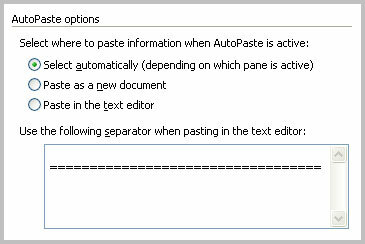 We have extended this feature in MyInfo 4 and in this major new version, you can configure Auto Paste to paste the information in the currently active document, instead of pasting it as a new document. The separator option will help you keep the pasted snippets more organized.